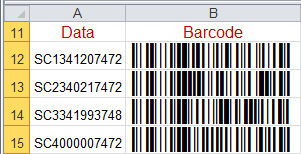 The characters used to generate Code 128 barcode symbols with the Universal Font provide compatibility for all countries, locales and operating systems. This implementation is unique because other Code 128 fonts use extended ASCII characters that are different in other font codepages, which vary depending on the country or locale setting in the operating system. In the evaluation version of this product, an intermittent “DEMO” watermark will appear at the top of the barcode which may cause scanner read errors. For testing purposes, a successful scan can be obtained by scanning the lower portion of the barcode that does not contain watermarks. If the demo version is used, it should be uninstalled before using the purchased version. © Copyright 2019 IDAutomation.com, All Rights Reserved. Legal Notices.